The complainants - the ADCB and its chairman - have said Rahul Gandhi and Randeep Surjewala levelled "false and defamatory allegations" against the bank. 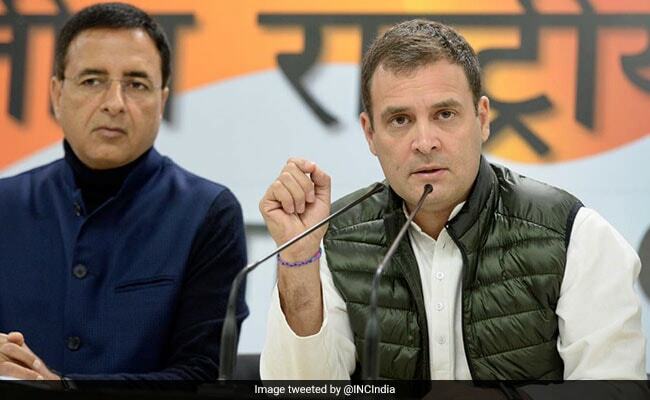 A local court Monday issued summons to Congress president Rahul Gandhi and its national spokesperson Randeep Singh Surjewala in a criminal defamation suit filed by the Ahmedabad District Cooperative Bank (ADCB) and its chairman Ajay Patel. BJP president Amit Shah is a director in the bank. The two complainants had moved the court last year after the Congress leaders reportedly alleged the bank was involved in "scam" to convert "Rs 750 crore" scrapped notes within five days of demonetisation in November 2016. Additional Chief Metropolitan Magistrate S K Gadhvi issued summons to the two leaders after finding prima facie evidence against them, and asked them to appear in the court on May 27. The court ordered this after holding a probe into the matter under section 202 of the CrPC (to enquire into the case to decide whether or not there is sufficient ground for proceeding) as part of which evidences were produced and witnesses examined. The complainants - the ADCB and its chairman Mr Patel - have said the two leaders levelled "false and defamatory allegations" against the bank. Mr Gandhi and Mr Surjewala had reportedly alleged the ADCB had received deposits of Rs 745.59 crore in demonetized currencies within five days of Prime Minister Narendra Modi announcing the note-ban, wherein higher denomination Rs 500 and Rs 1,000 bills were scrapped. The note ban announcement was made on November 8, 2016. The allegations were made by Mr Gandhi and Mr Surjewala on the basis of a response given by NABARD (National Bank for Agriculture and Rural Development) to an RTI query filed by a Mumbai-based activist. Mr Surjewala is the communication department in-charge of the Congress and the chief spokesperson of the main opposition party. In the pleas filed through their lawyer S V Raju, the ADCB and Patel submitted before the court that the statement made by both the Congress leaders was false because the bank did not exchange such a huge amount of money. They said the bank did not have so much (demonetised) money to exchange (with valid currency notes) and their claim was defamatory. Mr Gandhi had tweeted, "Congratulations Amit Shah ji, Director, Ahmedabad District Cooperative Bank, on your bank winning 1st prize in the conversion of old notes to new race. Rs 750 crore in 5 days!" "Millions of Indians whose lives were destroyed by demonetisation, salute your achievement," he had said on Twitter. Mr Surjewala had told the media, "We expect the prime minister will himself come forward and give answers on the charges against Amit Shah, whom he has appointed. "There should be an independent, time-bound probe into this entire scam," he had said.